In 2008, David Dwyer, a Moreton Bay Regional Councilor at that time, approached PRFMA with an idea aimed at helping to promote sustainable fishing within South East Queensland’s scouting movement. Utilising PRFMA’s skill base in fresh water fishery development and junior angler education,the Lake Gaffney Project was formulated. 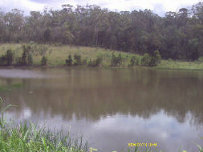 A relatively small lake located in bushland owned by Scouting Australia was identified as the best location for developing a new fishery. The lake has taken number of years to develop but when completed will become a “catch and release” only fishery, stocked to it’s maximum sustainable level. With no public access and “catch and release” only, the fishery promises to produce memorable firsts for our anglers of tomorrow. More importantly the scouts under the guidance of their responsible leaders will not only be able to catch fish regularly as beginners but will learn responsible fishing practices which will help care for the wider public fishery into the future. A South East Queensland’s leading fish hatcheries has donated Australian native fish fingerlings yearly to help make the project a reality. We a acknowledge Hanwood Fish Hatchery for their commitment to education and the future of sustainable fisheries. The PRFMA is a voluntary, community-based fish-stocking group whose objectives is, amongst other things, to undertake fish stocking of Lake Samsonvale and Lake Kurwongbah to improve the lake as a recreational fishery for the benefit of the general public.